Swiftpharm.com is Nigerias foremost online healthcare hub that provides a portal for you to get all your healthcare needs at your doorsteps. 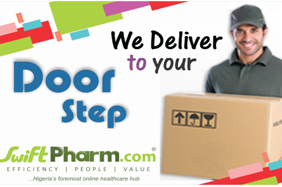 Shopping on www.swiftpharm.com is easy, accessible and convenient. Quality pharmaceutical products, Supplement, home diagnostic equipment, weight management, skin care, sexual and family health products from competent Pharmacies. Online diagnostic referral services (e-DRS) basically provides an avenue for diagnostic test to be carried out anywhere in the country in partnership with top notch diagnostic centers. Healthcare information propagation using our social media handles and blog post. Swiftpharm.com offers a convenient and accessible means for getting all your medical needs on the go. The portal is designed to work on Computers, Tablets and mobile devices .Users can also order products using the app which can be downloaded from Google play store and Apple store. We deliver between 1-3 working days all around Nigeria, location dependent. We also offer Returns and Refunds. Payments can be made with our various payment options; Payment on delivery, via direct bank transfer, or using online payment portal via Interswitch/GlobalPay portal. Swiftpharm.com offers discreet shopping. Also we have employed top notch security services for our portal and we do not demand, share or keep patient health information. Do not have internet or having poor internet service, swiftpharm.com has provided a personal shopper for you, all you do is call this number 09052581173 and your order will be placed for you. Easy!